In addition to being very much focused on the odd-ball characters of the DC Universe, DC Universe Classics was also committed to being a recreation of Kenner’s Super Powers line from the ‘80s. Initially, it was just thematically and somewhat stylistically, but eventually, sub-text became full text, and each assortment was given one direct Super Powers recreation. Today’s figure is one of those. 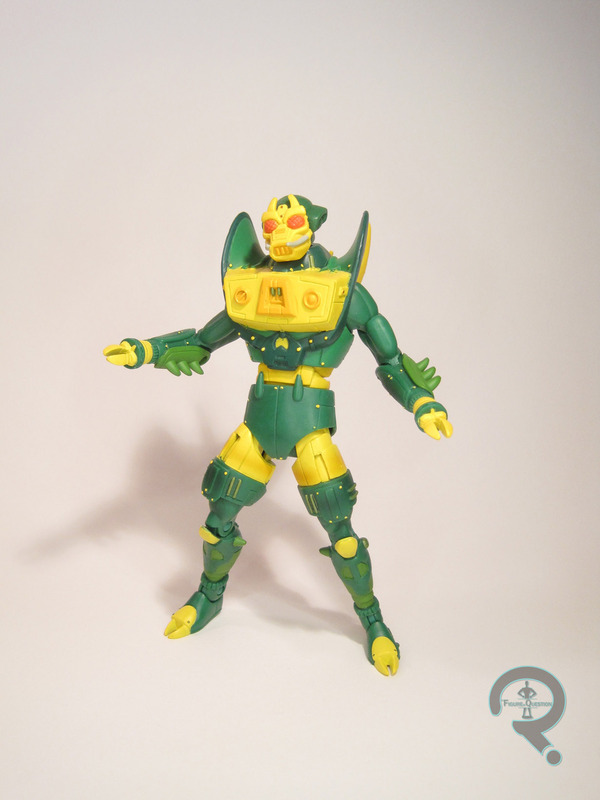 Mantis was released in Series 9 of DC Universe Classics. As he was a pre-existing New Gods character who just got a hefty redesign for Super Powers, there were actually two variants of Mantis in this assortment. The one seen here is, as mentioned above, the Super Powers design, which traded in the somewhat goofy spandex for a cool sci-fi robot thing. The figure stands 6 3/4 inches tall and he has 23 points of articulation. Despite what you might think, being a variant and all, the only parts shared between this and the classic Mantis are the upper arms, upper torso (albeit completely covered by an overlay), and knees, all of which are just the standard medium body pieces. Everything else was brand-new to this guy, as it well should be. It’s definitely one of the most impressive sculpts the line had to offer. It captures the ‘80s figure’s design very well, but also scales it up, adds some extra details, and just generally modernizes the whole thing. The only real problem I have is actually the re-use; the shoulders just end up looking a little bit out of place with the rest of the figure. 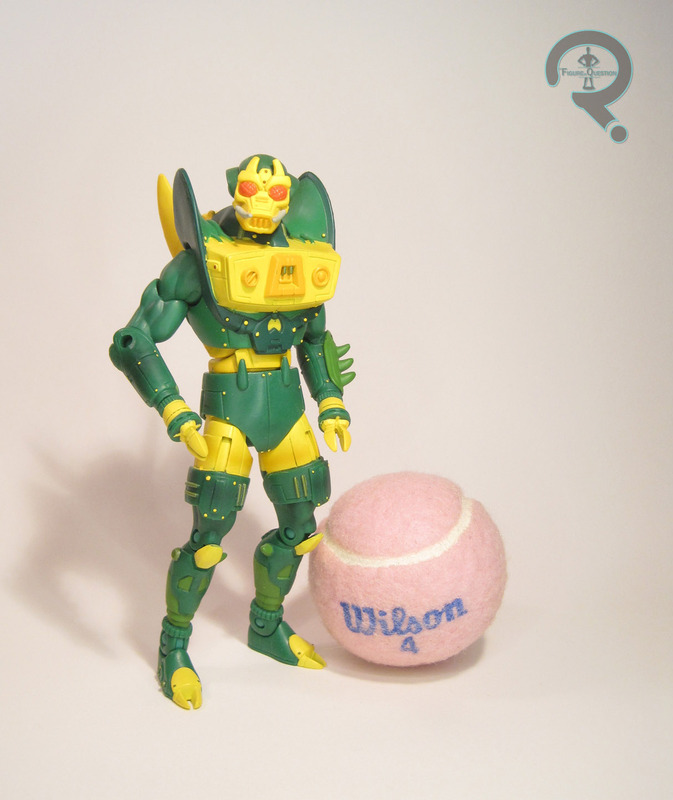 Still, not at all bad for a Mantis figure. Paintwork on Mantis is pretty impressive as well. There’s a lot of very bright, very bold color work, so he’ll definitely jump out on the shelf. He’s also got a whole ton of accent work, including some slight airbrushing to keep things from getting too bland. He really does represent the line at its peak. Mantis was packed with the arm of Chemo, the Collect-N-Connect for this particular series, and nothing else. Not sure there’s really much else you could have given him, though. Mantis is another recent addition. Series 9 suffered from some pretty fierce distribution problems, so I never found a lot of them at retail. Fortunately, Cosmic Comix recently bought someone’s DCUC collection, so I’ve been able to pick up a lot of the figures I’ve missed. I actually grabbed this figure back on Small Business Saturday, in an effort to be supportive. Mantis is definitely a fun figure, and I’m certainly happy to have finally gotten him!